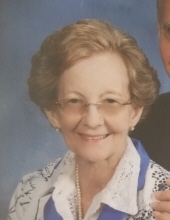 Jean Jones, 78, a longtime resident of Pensacola, died on February 9, 2019. She was predeceased by her parents Ezra and Jeanette Applewhite, a sister Grace Willing and a brother James Applewhite. She is survived by her husband of 58 years Gerald Jones, sons Nathan Jones (Linda) and Mark Jones, sisters Janie Burns and Kathryn Applewhite, brothers John and Harris Applewhite, and numerous nephews and nieces. Jean was born July 28, 1940, near Poplar Creek, MS. She was a member of Saint Luke UMC and enjoyed being a member of the Caring and Sharing Sunday School Class. She was a member of the Altar Guild and enjoyed being a part of the prayer shawl ministry. She was instrumental in organizing a group which made the Chrismons (Christian Symbols) which still adorn the annual Christmas tree. Jean was a master gardener and enjoyed growing flowering trees, shrubs, and other plants in her yard. Some of her happiest hours and days were spent planting, growing and caring for her plants. She also grew African violets indoors, was a member of the African Violet Society. She won many awards with her show plants. Visitation will be on Tuesday from 10-11 a.m. followed by the funeral service at Saint Luke United Methodist Church. A special thanks to the Pastors and congregation at Saint Luke. Also to her wonderful and loving caregivers Daina (De De) Groh, Christine (Chrissy) Smith, Cheri Young, and our neighbor and her caregiver Vickie Parker. Also, the wonderful and caring staff and employees at the Fresenius Dialysis Center, Covenant Hospice and West Florida Hospital. Jean will be taken to the Poplar Springs Baptist Church Cemetery near Kilmichael in the hill country of Mississippi to her final resting place. There she will join four generations of Applewhite’s. To send flowers or a remembrance gift to the family of Jean A. Jones, please visit our Tribute Store. "Email Address" would like to share the life celebration of Jean A. Jones. Click on the "link" to go to share a favorite memory or leave a condolence message for the family.